It has been of much interest whether there is functional redundancy between the constitutively signaling pre-Tα/TCRβ (pre-TCR) and ligated TCRαβ complexes, which independently operate the two distinct checkpoints during thymocyte development, i.e., the pre-TCR involved in β-selection at the CD4−CD8− double-negative stage and the TCRαβ being crucial for positive/negative selection at the CD4+CD8+ double-positive stage. We found that the pre-TCR expressed on double-positive cells in TCRα-deficient (TCRα−/−) mice produced a small number of mature CD8+ T cells. Surprisingly, when pre-Tα was overexpressed, resulting in augmentation of pre-TCR expression, there was a striking increase of the CD8+ T cells. In addition, even in the absence of up-regulation of pre-TCR expression, a similar increase of CD8+ T cells was also observed in TCRα−/− mice overexpressing Egr-1, which lowers the threshold of signal strength required for positive selection. In sharp contrast, the CD8+ T cells drastically decreased in the absence of pre-Tα on a TCRα−/− background. Thus, the pre-TCR appears to functionally promote positive selection of CD8+ T cells. The biased production of CD8+ T cells via the pre-TCR might also support the potential involvement of signal strength in CD4/CD8 lineage commitment. The development of T cells in the thymus is controlled at two consecutive checkpoints (1, 2). At the first checkpoint, termed β-selection, CD4−CD8− double-negative thymocytes with a productive TCRβ rearrangement are rescued from programmed cell death by the pre-TCR consisting of the varied TCRβ and the invariant pre-TCRα (pTα)4 chain. As a result, the cells proliferate, and begin to coexpress CD4 and CD8 and to rearrange the TCRα locus. Some evidence suggests that the pre-TCR is also involved in channeling cells into the αβ-lineage because it reduces the number of γδ T cells with productive TCRβ rearrangements (3, 4). At the second checkpoint, the engagement of the TCRαβ by appropriate MHC ligands rescues CD4+CD8+ double-positive (DP) thymocytes from apoptotic death, resulting in the generation of mature CD4+CD8− or CD4−CD8+ single-positive (SP) thymocytes. Very interestingly, there exists an obvious similarity of proximal signaling events between the constitutively signaling pre-TCR and the ligated TCRαβ, resulting in tyrosine phosphorylation of CD3ζ and CD3ε subunits, recruitment and phosphorylation of ZAP-70 and syk protein kinases, activation of the ras/mitogen-activated protein kinase pathway, and rapid increase in intracellular calcium levels (5, 6, 7, 8, 9). Because of these similarities, we asked the question whether in certain situations the pre-TCR can partially or even entirely substitute for the ligated TCRαβ, resulting in the generation of “αβ-less” mature T cells. In this study, we approached this question by qualifying different strains of mice expressing the pre-TCR on the DP precursor cells. A 1.3-kb fragment of pTα cDNA (kindly provided by H. J. Fehling, Ulm, Germany) was subcloned into the blunt-ended BamHI site of the expression vector controlled by the lck-proximal promoter (10). The complete plasmid (plck-pTα) was digested with NotI, and the transgene fragment no longer containing vector sequence was purified by Geneclean II kit (Bio 101, Vista, CA). DNA was microinjected into fertilized eggs of C57BL/6 mice. Resulting founders were screened for transgene by PCR and Southern blotting. Five independent founders carried the transgene. Two of the five mice that expressed transgene at relatively higher levels, as assessed by Northern blotting using thymus RNA, were backcrossed within TCRα−/− background. All animals used in the experiments were cared in accordance with institutional guidelines. Total RNA was isolated from thymus and lymph nodes (LNs) by using RNAzolB (Tel-Test, Friendswood, TX) from various mice. A quantity amounting to 15 μg total RNA was denatured, electrophoresed in a 1% agarose gel, blotted on a nylon membrane, and then hybridized with 32P-labeled either pTα or β-actin cDNA fragment. Thymocytes from various mice (6.0 × 107) were lysed at a concentration of 1 × 108 cells/ml in a Triton X-100-containing lysis buffer (20 mM Tris-Cl, pH 7.6, 150 mM NaCl, 2.0 mM EDTA, and protease and phosphatase inhibitors). The TCRζ subunit was specifically immunoprecipitated with an anti-ζ mAb (6B10.2). The immunoprecipitates were separated on SDS-PAGE and transferred to Immobilon-P membranes (Millipore, Bedford, MA). Membranes were immunoblotted with anti-phosphotyrosine or anti-ζ mAb, as previously described (7). Abs used in this study: anti-mouse CD4 (GK1.5), anti-mouse CD8α (53-6.7), anti-mouse TCRβ chain (H57-597), anti-mouse TCRγδ (GL-3), anti-mouse CD8β (H35-17.2), anti-pan NK cells (DX-5), anti-Thy-1.2 (30-H12), anti-mouse CD25 (3C7), anti-mouse CD69 (H1.2F3), anti-mouse heat-stable Ag (HSA) (30-F1), anti-phosphotyrosine (4G10), and anti-CD3ζ (6B10.2) were purchased from BD PharMingen (San Diego, CA). The anti-CD3ε mAb (145-2C11) was purchased from eBioscience (San Diego, CA). Intracellular staining was performed by using the Cytofix/Cytoperm kits (BD PharMingen). For IL-2 production, LN cells (1.0 × 106 cells/well) either from wild-type (WT) or pTα-transgenic (TG)/TCRα−/− mice were cultured in the presence or absence of 10 ng/ml of PMA + 5 × 10−7 M of ionomycin (Sigma-Aldrich, St. Louis, MO) in a 96-well plate for 16 h. The cells were then stained for intracellular IL-2 and cell surface CD8. CD8+ cells were analyzed for IL-2 levels by FACSCalibur cytometer (BD Biosciences, San Jose, CA). For expression of activation markers, LN cells (1.0 × 106 cells/well) either from WT or pTα-TG/TCRα−/− mice were cultured in the presence or absence of 1 μg/well of immobilized anti-CD3ε mAb or 1 μg/ml Con A in a 96-well plate for 16 h. The anti-CD3ε mAb was immobilized by preincubation of wells at 4°C overnight. The cells were then stained for CD8, γδ, intracellular TCRβ (intβ), and either for CD25 or CD69, and then analyzed by cytometer. CD8+γδ−intβ+ cells were analyzed for expression of either CD25 or CD69. First, we analyzed a set of mice expressing either low or high levels of the pre-TCR in the absence of TCRα chain, i.e., TCRα-deficient (TCRα−/−) mice (11) or TCRα−/− mice expressing a transgenic pTα chain under the regulation of lck-proximal promoter. In thymocytes of TCRα−/− mice, the pre-TCR should be expressed at some level in DP thymocytes because most of the cells express the TCRβ chain due to β-selection, and still express the pTα chain that in this situation cannot be outcompeted by the TCRα chain (12). In the newly developed pTα-transgenic mice on a TCRα−/− background (pTα-TG/TCRα−/− mice), the pTα expression was much higher than in TCRα−/− mice in the thymus, although it was at undetectable level in the peripheral lymphoid organs by Northern blotting, which is compatible with the characteristic of the transgene prompter (10) (Fig. 1⇓A). To assess whether the amount of signals mediated via the pre-TCR in each cell at the DP stage was actually strengthened by pTα overexpression in transgenic mice, we analyzed the tyrosine phosphorylation of CD3ζ chains in thymocytes, which are known to be functionally coupled to both the pre-TCR as well as the TCRαβ (7, 13, 14, 15). To this end, CD3ζ chains were immunoprecipitated from lysates of thymocytes from either pTα-TG/TCRα−/−, TCRα−/−, or WT mice, and their phosphorylation status was examined. In pTα-TG/TCRα−/− and TCRα−/− mice, CD3ζ chain should associate only with the pre-TCR, because of the lack of TCRαβ in the absence of α-chain. As illustrated in Fig. 1⇓B, there was much more CD3ζ chain phosphorylation in thymocytes from pTα-TG/TCRα−/− as compared with those in TCRα−/− (highlighted as ζ-PO4), whereas total amounts of precipitable ζ-chains were almost equal in both strains (bottom panel, CD3-ζ). Thus, pTα overexpression appeared to achieve efficiently increased signals through the pre-TCR in transgenic thymi. 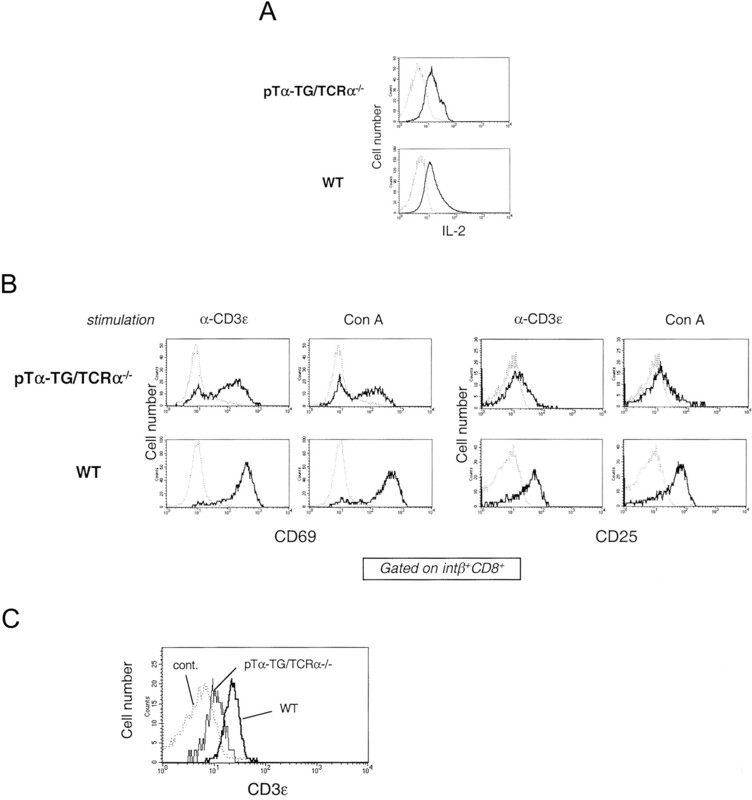 Positive selection of CD8+ T cells by the pre-TCR. A, The pTα expression was markedly enhanced in the thymus (Thy) of pTα-TG/TCRα−/− mice, but not in the LN, as assessed by Northern blotting. B, Increased CD3ζ chain phosphorylation under the overexpression of pTα in TCRα−/− mouse thymocytes. Lysates of thymocytes from WT, TCRα−/−, and pTα-TG/TCRα−/− mouse thymi were immunoprecipitated with an anti-CD3ζ mAb and probed sequentially on Western blots with anti-phosphotyrosine mAb 4G10 (top panel) and anti-CD3ζ mAb 6B10.2 (bottom panel). C, LN (mesenteric and inguinal) cells from either TCRα−/− or pTα-TG/TCRα−/− mice were stained with anti-CD4, anti-CD8α, and anti-TCRβ chain (for intracellular staining) and analyzed by FACSCalibur cytometer (BD Biosciences). CD4/CD8α profiles of the cells pregated on intβ+ population are displayed. The intβ+CD8+ cells were remarkably increased in pTα-TG/TCRα−/− mice (right panel) as compared with those in TCRα−/− mice (left panel). These intβ+CD8+ cells were analyzed for TCRγδ (D), and for CD8β, Thy-1.2, and DX-5 (E) by using specific mAbs. For expression of CD8β, Thy-1.2, or DX-5 presented in E, the intβ+CD8+ cells gated on γδ-negative population were analyzed. Dashed lines present positive or negative controls: γδ+ populations within CD4−CD8− cell population (for D), B220 (B cell marker)-positive cells within LN cells stained for CD8β or Thy-1.2, and DX-5-positive NK cell population within CD4−CD8− cell population (for E). Surprisingly, peripheral LNs of pTα-TG/TCRα−/− mice contained a large number (2.7 × 105 cells in all of collected mesenteric and inguinal LNs: 4.5% of total LN cells) of CD8+ cells that harbored intβ (Fig. 1⇑C, right). A small, but clearly detectable number of the intβ+CD8+ cells also did exist in LNs from TCRα−/− mice (1.2 × 104 cells in LNs, 0.2% of total LN cells; Fig. 1⇑C, left). These intβ+CD8+ cells were TCRγδ− (Fig. 1⇑D), Thy-1.2+, and CD8α+β+, and lacked expression of DX-5, a pan-NK cell marker (Fig. 1⇑E), thus satisfying the criteria for αβ-lineage T lymphocytes despite the absence of TCRαβ complexes. These findings strongly implicate that the pre-TCR harbors some potential of mediating signals required for positive selection of CD8+ SP cells. The presence of a small number of intβ+CD8+ cells even in LNs from nontransgenic TCRα−/− mice is consistent with the very low, but significant amount of CD3ζ chain phosphorylation detectable in TCRα−/− thymocytes (Fig. 1⇑B). Consistently, a far increased number of mature CD8+ SP thymocytes, displaying a low level of the HSA (CD24) expression, were detected in the thymus of pTα-TG/TCRα−/− mice than in the thymus of TCRα−/− mice (Table I⇓). In LNs from both TCRα−/− and pTα-TG/TCRα−/− mice, a small number of intβ+CD4+ cells was also detected (Fig. 1⇑C). Such intβ+CD4+ cells had been previously reported as CD4+TCRβlow+ cells, and it was not clear whether they were derived from the thymus (16, 17, 18). In contrast to the intβ+CD8+ cells, the number of these CD4+ cells was comparable in both types of mice (1.8 × 104 in LNs, 1.3 × 105 in the spleen in TCRα−/−, vs 1.6 × 104 in LNs, 1.1 × 105 in the spleen in pTα-TG/TCRα−/−), suggesting that the level of the pre-TCR complexes expressed in the thymus does not influence the development of the cells. Both strains also had intβ+CD4−CD8− cells, which consisted of γδ cells (3) and a proportion of DX-5+-NK T-like cells (data not shown). We further analyzed whether lowering the threshold for signaling required for positive selection by overexpressing of the Egr-1, a zinc-finger transcription factor, would increase the generation of intβ+CD8+ T cells in TCRα−/− mice (19, 20). We previously reported that overexpression of Egr-1 in thymocytes markedly lowered the threshold of signal strength through the TCRαβ (or the avidity of TCR/MHC interaction) required for positive selection of mature SP thymocytes (19), and thus one might expect that Egr-1 could also lower the signal strength of the pre-TCR required for positive selection of intβ+CD8+ T cells. The result illustrated in Fig. 2⇓A shows that this is in fact true: the Egr-1 transgene expression on the TCRα−/− background (Egr-TG/TCRα−/−) resulted in a phenotype very similar to that of pTα-TG/TCRα−/− mice, in which a large (even larger than in pTα-TG/TCRα−/−) proportion (5.5 × 105 in LNs, 7.5% of total LN cells) of intβ+CD8+ cells with a γδ−, Thy-1.2+, CD8α+β+, DX-5− phenotype was present in peripheral LNs. As shown in Fig. 2⇓B, their thymi also harbored a proportion of the HSAlow CD8+ mature SP thymocytes. Likewise, the absolute number of the HSAlow CD8+ mature SP cells in Egr-TG/TCRα−/− thymus was larger (∼2.5 times) than that in pTα-TG/TCRα−/− thymus (see Table I⇑ and Fig. 2⇓B). 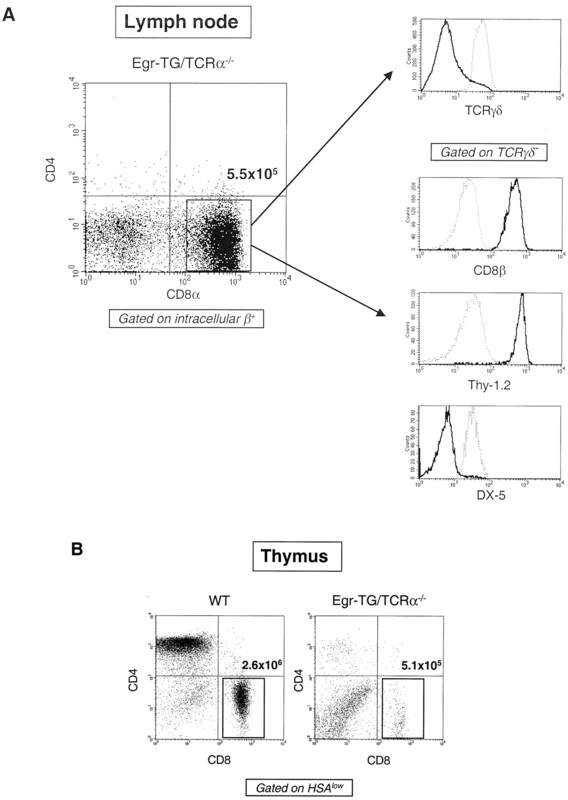 Peripheral CD8+ T cells were also increased under the Egr-1 overexpression in TCRα−/− mice. A, LN (mesenteric and inguinal) cells from Egr-1 transgenic mice on a TCRα−/− background (Egr-TG/TCRα−/− mice) were analyzed for the presence of intβ+CD8+ T cells by staining, as described in the legend for Fig. 1⇑, C–E. B, Thymocytes from WT or Egr-TG/TCRα−/− mice were stained for CD4, CD8, and HSA, then analyzed by cytometer. Demonstrated are the CD4/CD8 profiles of mature thymocytes, which were pregated on HSAlow populations. Further evidence for the involvement of the pre-TCR in positive selection of intβ+CD8+ T cells was observed in TCRα enhancer-deficient (Eα−/−) mice (21): They likewise possessed a comparable (or even a slightly larger) proportion of intβ+CD8+ cells in the LNs as TCRα−/− mice (1.9 × 104 in LNs, 0.4% of total LN cells; Fig. 3⇓, left panel). Moreover, in mice doubly deficient for Eα and pTα (22) (pTα−/−/Eα−/− mice), the number of the CD8+ cells drastically decreased (<5 × 103 in LNs; Fig. 3⇓, right panel), confirming the indispensable requirement of the pTα chain for the selection event. Again, the presence of a similar proportion of the intβ+CD4+ cells in Eα−/− and pTα−/−/Eα−/− mice (3.6 × 104 in LNs of Eα−/−, vs 3.4 × 104 in LNs of pTα−/−/Eα−/−) supports the notion that the development of the intβ+CD4+ cells in the absence of TCRα is pre-TCR independent. Interestingly, the number of the intβ+CD4+ cells was larger in Eα−/− mice than in TCRα−/− mice (see Fig. 1⇑C). 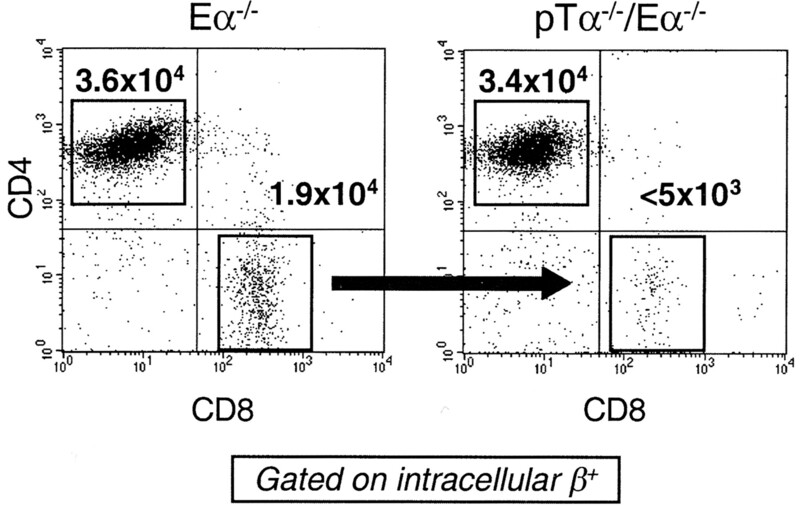 In addition, the proportion of the intβ+CD4−CD8− cells in Eα−/− mice was much smaller than in TCRα−/− mice (compare Figs. 1⇑C and 3). The precise reason for this difference is unclear. Eα might also influence the development of the intβ+CD4−CD8− cells, although further study will be required. All facts considered, it is very likely that signals mediated by the pre-TCR and the ligated TCRαβ are functionally equivalent with regard to positive selection of CD8+ cells from DP precursors. Peripheral CD8+ T cells were remarkably decreased in the absence of pTα. The presence of the CD8+ T cells was comparably analyzed in the LNs from TCRα enhancer-deficient (Eα−/−) mice and Eα, pTα doubly deficient (pTα−/−/Eα−/−) mice by staining, as in the previous experiments (see legends for Figs. 1⇑ and 2⇑). The intβ+CD8+ cells were drastically decreased in pTα−/−/Eα−/− mice. Having intβ+CD8+ cells undergo positive selection by the pre-TCR, we then addressed whether these cells are functionally equivalent to the T cells from WT mice. First, we addressed the IL-2 production by the CD8+ cells in response to ionomycin + PMA. LN cells from either pTα-TG/TCRα−/− or WT mice were stimulated in the presence or absence of ionomycin + PMA for 16 h, then IL-2 production in the CD8+ cells were determined by intracellular staining analysis for IL-2. As shown in Fig. 4⇓A, CD8+ cells from both pTα-TG/TCRα−/− and WT mice efficiently produced IL-2 upon stimulation. Second, the activation status of the CD8+ cells in response to either CD3ε cross-linking or Con A stimulation was also studied. LN cells were stimulated by immobilized anti-CD3ε Ab or Con A, then the expression levels of T cell activation markers, CD25 and CD69, on the CD8+ cells were analyzed. As illustrated in Fig. 4⇓B, CD8+ cells from pTα-TG/TCRα−/− mice functionally responded to either stimulation, demonstrating up-regulation of these markers. Probably due to the less amount of CD3ε on the cell surface, as demonstrated in Fig. 4⇓C, CD69 and CD25 expression levels after stimulation were lower in pTα-TG/TCRα−/− than in WT. Together, the CD8+ cells selected by the pre-TCR were functionally competent. CD8+ T cells selected by the pre-TCR are functionally competent. A, LN cells either from WT or pTα-TG/TCRα−/− mice were cultured in the presence or absence of 10 ng/ml of PMA + 5 × 10−7 M of ionomycin. The cells were then stained for intracellular IL-2 and CD8. Intracellular IL-2 levels in CD8+ cells are present. The solid lines represent the level of intracellular IL-2 when incubated with stimulation, whereas the dashed lines represent those on cells incubated without stimulation. B, LN cells either from WT or pTα-TG/TCRα−/− mice were cultured in the presence or absence of 1 μg/well of immobilized anti-CD3ε mAb or 1 μg/ml of Con A. The cells were then stained for CD8, γδ, intβ, and either for CD25 or CD69, and then analyzed by cytometer. CD25 and CD69 expression on CD8+γδ−intβ+ cells are presented. The solid lines demonstrate the expression of CD25 or CD69 when incubated with stimulation, whereas the dashed lines represent those on cells incubated without stimulation. 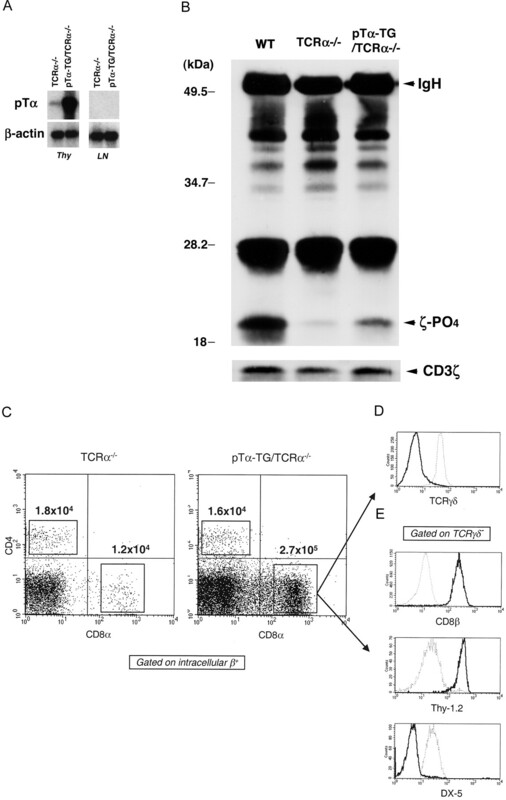 C, Lower expression of CD3ε on CD8+ cells from pTα-TG/TCRα−/− mice. LN cells either from WT or pTα-TG/TCRα−/− mice were stained for CD3ε, CD8, γδ, and intβ+, and analyzed by cytometer. CD3ε expression on CD8+γδ−intβ+ cells is presented. Bold line, WT; solid line, pTα-TG/TCRα−/−; dashed line, negative control (CD3ε expression on B220+ LN B cells). Positive selection mediated by TCRαβ strictly requires interaction between the TCR and appropriate class I or class II MHC/Ag-peptide complex. We wondered whether positive selection of CD8+ cells operated by the pre-TCR is also dependent on MHC molecules. We investigated this question by analyzing the proportion of the intβ+CD8+ T cells in mice doubly deficient for class I MHC and TCRα, or for class II MHC and TCRα, which were generated by cross-breeding of TCRα−/− mice with either class I MHC−/− (K−/−D−/−) (23, 24) or class II MHC−/− (Aβ−/−) (25) mice. No obvious difference in the size of the intβ+CD8+ T cell population was detected between the MHC/TCRα doubly deficient vs TCRα−/− mice (Table II⇓), suggesting that the recognition of MHC Ags by the pre-TCR is not required for the selection event. We also studied β2-microgloblin (β2m)−/−TCRα−/− and TAP−/−TCRα−/− mice (26) to test possible involvement of nonclassical MHC molecules (most of which are dependent on β2m and/or TAP for their cell surface expression). Again, a comparable fraction of the intβ+CD8+ T cells was observed in β2m−/−TCRα−/− and TAP−/−TCRα−/− when compared with TCRα−/− mice (Table II⇓). In addition, we also analyzed β2m−/−Aβ−/− TCRα−/− mice, which lack both class I and class II MHC as well as most of nonclassical MHC molecules. Likewise, the number of intβ+CD8+ T cells in these mice was equivalent to that in TCRα−/− mice (Table II⇓). Thus, recognition of MHC molecules (either classical or nonclassical) is not necessary for the pre-TCR to mediate positive selection. At the transition stage from the double-negative to the DP (β-selection), it has been shown that pre-TCR localizes cell autonomously to membrane rafts, where it appears to signal in a constitutive and ligand-independent manner (4, 27, 28). Likewise, the recognition of an extracellular ligand might not be required for positive selection by the pre-TCR, while we cannot mutually exclude an involvement of non-MHC cell surface ligand(s). In this study, we demonstrated that the pre-TCR can promote positive selection of CD8+ T cells in the thymus, by comparatively analyzing various strains of mice. Our observation strongly implies that the pre-TCR signals bear functional resemblance to those transduced by the TCRαβ following ligand engagement. One may wonder why the pre-TCR appeared to select predominantly CD8+ cells. One possible explanation might be insufficient signal strength to induce CD4+ cells in TCRα−/− mice, and even in pTα-TG/TCRα−/− or Egr-TG/TCRα−/− mice. Accumulating evidence suggests that the strength and/or duration of TCR signaling appear to influence CD4/CD8 lineage commitment (29, 30, 31, 32, 33). Indeed, positive selection of CD8+ cells by weak TCR signals has been demonstrated in various experiments (34, 35). The lower level of CD3ζ chain phosphorylation in thymocytes from pTα-TG/TCRα−/− (selecting predominantly CD8+ cells) as compared with WT animals (selecting both CD4+ and CD8+ cells) as shown in Fig. 1⇑B might be sufficient for positive selection of CD8+ cells, but not for CD4+ cells. Recently, a new perspective, referred to as kinetic signaling model, was proposed based on a precise in vitro analysis of DP cells undergoing TCR signals (36, 37, 38). This model postulates that: DP cells terminate CD8 transcription and convert into CD4+CD8low+ intermediate cells in response to TCR (+coreceptor) signals; these CD4+CD8low+ intermediate cells are not yet lineage committed and retain the potential to differentiate into either CD4 or CD8 mature SP cells; sustained signaling in these cells results in their differentiation into CD4 SP cells, whereas cessation of signaling results in coreceptor reversal and differentiation into CD8 SP cells. In TCRα−/− as well as Egr-TG/TCRα−/− mice, the biased CD8+ cell production might fit with the model, because endogenous pTα expression is rapidly down-regulated during the transition from the DP to the SP stage (lower in late DP cells than in early DP cells, then almost undetectable in mature SP thymocytes) (39), perhaps resulting in a decreased expression level of the pre-TCR in CD4+CD8low+ intermediate as compared in DP cells. However, the potential difference of the pTα transgene expression in DP and CD4+CD8low+ intermediate cells will need to be determined to extend this explanation to the priority of CD8+ cell production in pTα-TG/TCRα−/− mice as well. The alternative view of course is that pre-TCR signals never have the strength required for CD4+ T cell production. In summary, our observations provide new insights on thymocyte development, two of which may be worth re-emphasizing. First, the fact that the pre-TCR can promote positive selection of CD8+ T cells further suggests the functional resemblance of the signaling pre-TCR and the ligated TCRαβ. Second, the biased production of CD8+ T cells by the pre-TCR signals may support the propriety of hypothesis for the involvement of signal strength in CD4/CD8 lineage commitment. We thank Drs. H. J. Fehling (Ulm, Germany) for providing pTα cDNA; F. Lemonnier (Paris, France) for K−/−D−/− mice; F. W. Alt (Boston, MA) for Eα−/− mice; C. Minjares and S. Hall for creating transgenic mice and help with care of the mice; and Drs. S. Ward and J. D. Farrar (Dallas, TX) for critical reading of the manuscript. ↵1 This work was supported by research grant of Juvenile Diabetes Foundation (1-2001-581), American Liver Foundation Herman Lopata Memorial Liver Scholar Award, and Howard Hughes Medical Institute research support (to T.M. ); National Institutes of Health Grant RO1AI42953 (to N.S.C.v.O. ); National Institutes of Health Grants RO1A14728 and RO1A145846 (to H.v.B. ); and the “Eugenia Spanopolou” (to I.A.). ↵2 Y.I. and S.A. contributed equally to this study. 4 Abbreviations used in this paper: pTα, pre-TCRα; DP, double positive; β2m, β2-microglobulin; HSA, heat-stable Ag; intβ, intracellular TCRβ; LN, lymph node; SP, single positive; TG, transgenic; WT, wild type.